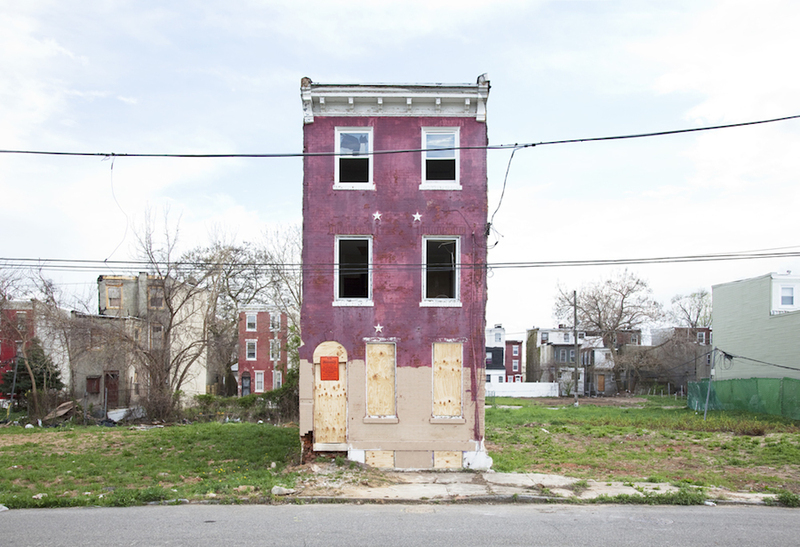 Like a lone pea out of its pod, the desolation of a solo row house waxes stark in Baltimore-based photographer Ben Marcin’s new series: Last House Standing. Often painted in garish colors at variance with their boarded-up windows and battered brickwork, the row houses are an architectural quirk of certain cities along the eastern seaboard. 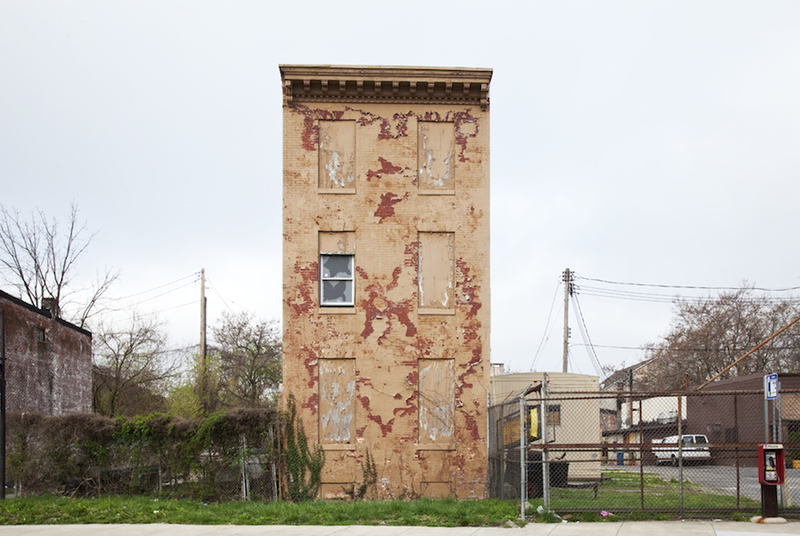 Marcin’s fascination stems from the details that come to the fore only when one house is left standing—once indistinguishable in a cookie-cutter row of identical three-story walk-ups. “My interest in these solitary buildings is not only in their ghostly beauty but in their odd, almost defiant, placement in the urban landscape…They were clearly not designed to stand alone like this,” Marcin wrote on his website. 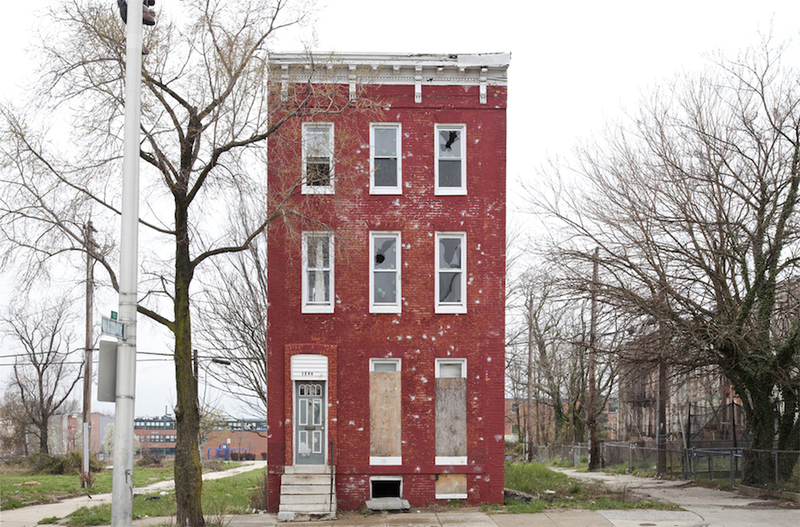 Many row houses received the wrecking ball long before the housing bubble burst, when population decline caused entire streets of row houses to be vacated. Naked trees, subdued skies and surrounding vacant lots add to the spellbinding, ghost town–like ambiance of Marcin’s shots, each building’s endurance a “defiance” of sorts. 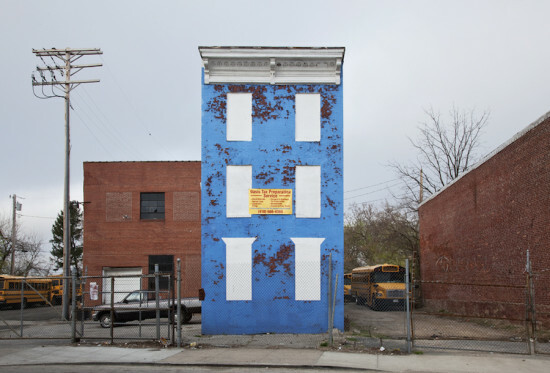 The first abandoned dwelling to catch his eye was a bright-blue three-story building with six front windows that had been boarded up and painted white, and a door which had been AWOL for years. 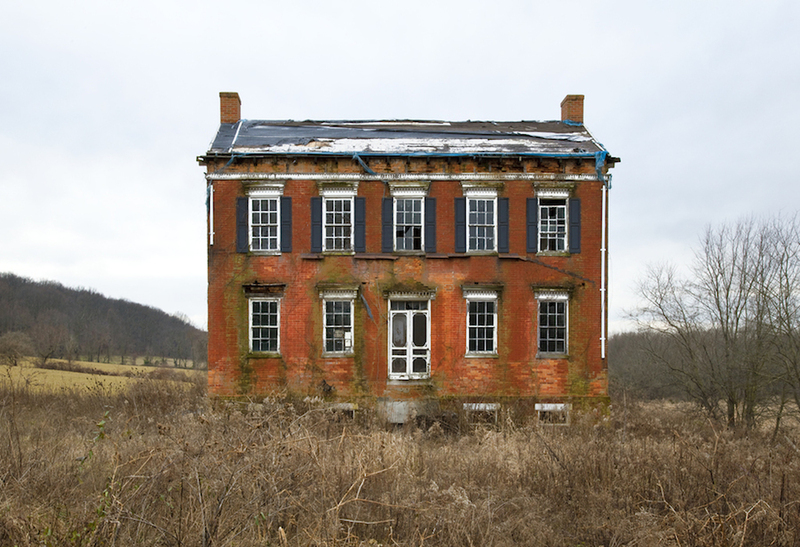 The pretty 19th-century cornice on the roof, however, remained intact. 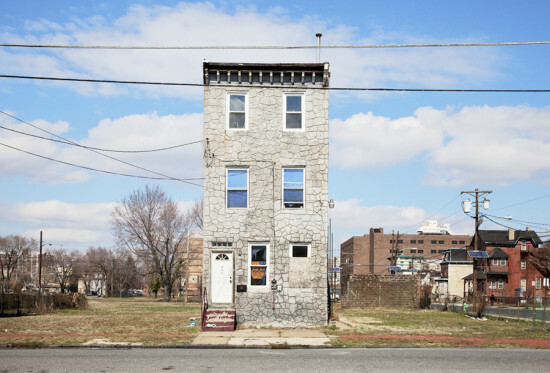 Marcin scoped out more desolate domiciles by bike in East and West Baltimore, his fixation eventually luring him to Mid-Atlantic cities in New Jersey, Maryland and Pennsylvania. The 55-year-old software developer at the Social Security Administration regularly consults Google Maps to discover more empty lots populated by a lone building. “They’re kind of like me. I was a bit of a loner in life by choice. And these subjects are standing out there by themselves,” Marcin told the Baltimore Sun. 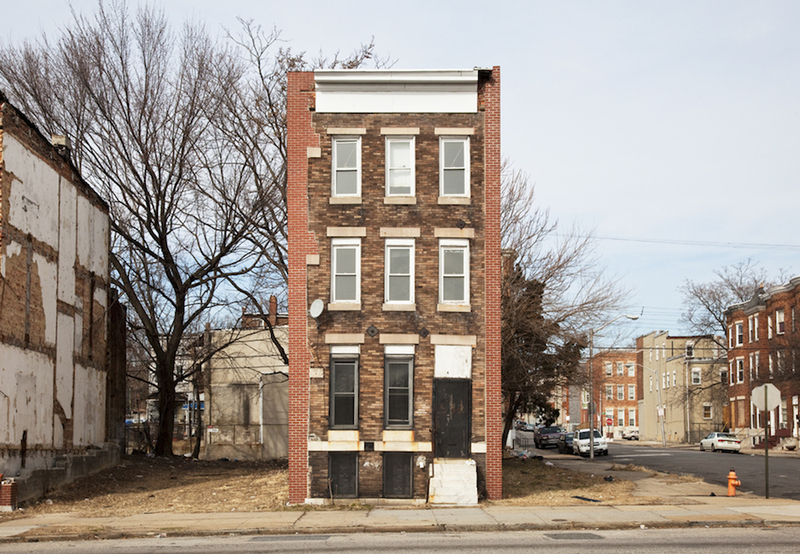 Baltimore authorities have plans to demolish the remaining row houses in favor of new housing developments, despite protests from residents at hearings. Marcin aims to archive every number of the dying breed before it’s too late. Marcin’s previous exhibition, A House Apart, connotes this same sense of abandonment, showing awkwardly perched ramshackle dwellings and tiny, speck-like cabins amidst barren desert. In The Camps, Marcin hunted for the makeshift dwellings of the homeless—one of which is merely a blanket draped over a thistle of branches.